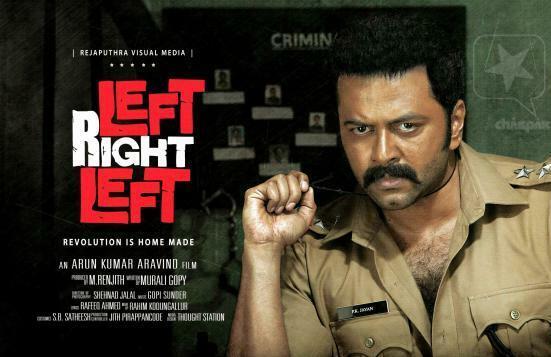 Left Right Left malayalam movie review and FDFS reports from theatres in Kerala are given here. The movie Left Right Left is a good entertainer which narrates the communist thoughts at three periods of time. The director has done a very good job to present such a film that totally relates with our social life and situations. As an actor, Indrajith played his role very well. The actresses Remya Nambissan, Lena were also played important roles in this film. After a long time, a Malayalam movie has been released that narrates the present social and political conditions. The film is not just a political film, but it's a good script movie that make viewers think, enjoy, and motivates at various situation. In a single word we can tell that, the film Left Right Left is an interesting film that makes viewers satisfied at its best. While watching this movie, we may feel that, the characters of this film are known persons to us in our life. Because, it close as much as possible to the reality of our social life. In this present time, we can see that all films are based on new trends and say that they are new generation films. But, this film left right left is not a new generation film but a new thinking film. This is the second attempt from the director after the movie, E Adutha Kaalathu, which was also a good film while considering the story. The performance of the actor Indrajith was really surprising as he done a very good job. He has played the role of a sub inspector of police, Jayachandran. The film narrates some persons in our society indirectly at some instants. Murali gopi has been played the role of Roy Joseph,(Cheguvera Roy,) performed well in this movie. he narrates the character of a communist in 1990s. Even though there is no varieties in this film, we will never get bored at any instants while watching the film. left right left is actually just like a good social drama that depicts various communist thoughts in three periods of time, ie 80s, 90s, and present. At the same time the director has given good priority to entertainment values of the audience. The music composed by Gopi Sunder was just awesome and background score was also very nice as it helps the viewers to feel the situations. The cinematography from Shehnad Jalaal's was excellent in the sense; he brings many scenes without losing its reality and natural beauty. The actress Remya Nambissan and Lena were performed well in this film. Lena done the role of Anita who is the wife of Roy Joseph and Remya Nambissan played the role of Jennifer as a nurse. The narration of the film is also good; this credit goes to the director Arun Kumar. The film will be a good turn in the carrier of Indrajith, who is now quite selective in his films. Even though there are lots of movies released along with this, it's sure that, Left right Left will definitely place a position in the hit charts of 2013. Everyone who loves Malayalam movies will definitely watch this film. Actually this film will be a result of great risks as it based on political story. When we look into the history of political story based films in Malayalam, we may see that, there will not be any commercial hits after 2000. Each one who watched this film will appreciate the director for his great attempt in this contest. Totally, this film is good entertainer with all essence, like good script, music, narration, performance of Indrajith and all other crews.